The Mrs. Yoy Blog: You need help? Today we were lunching at CPK. Big E needed a diaper change, so I grabbed him and rushed off to the ladies restroom. There were two stalls. We made a beeline for the changing table within the handicap stall. Big E was narrating everything as usual. I heard the door swing open and someone walk into the stall next to us. Great, now Big E has an audience. Hopefully, he won't notice we are not alone. He asked her three times. I'm thinking to myself, hey Big E, why don't you learn how to use the big boy potty before you start administering advice in public restrooms? 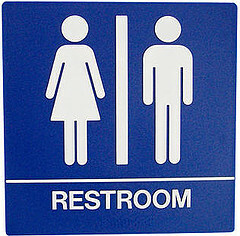 And, by the way, there is public restroom etiquette. At the top of the list of things that are not socially acceptable is talking to unknowns in the stall next to you. See Atlanta Airport Restrooms for further proof. What sort of help did he have in mind, anyway? Unrolling yards and yards of toilet paper? Attempting to flush the toilet for her? I finish his diaper change and rush out of the bathroom. She is at the sink laughing and washing her hands. The only thing I can think to say to her is, he's a good helper. LOL!!! I ♥ your posts!! !